GiftsToGive is fueled exclusively by volunteers – and we need you to join us! We have meaningful work for volunteers starting at age three. Seriously! Our youngest volunteers make art – wrapping paper for our birthday program. Older students inspect toys to ensure they work and have all their parts – and they’re so much better at it than adults! Teenage student fashionistas put together packages of well-coordinated outfits. 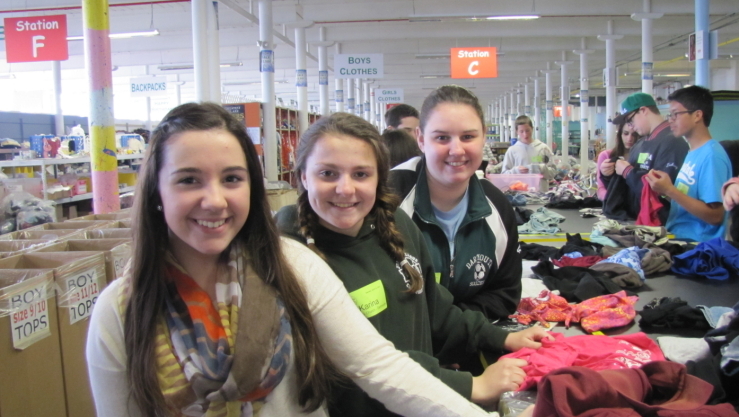 Adults do everything from sorting donations to fixing things that break around the factory. We have useful work for anyone and try to make use of the unique gifts that everyone has to give. Individuals and families may just “drop in” at the factory and we’ll put you to work. We’re open for volunteers six days a week. We open every day at 9am. We close at 5pm on Monday, Tuesday, Thursday and Friday. We close at 2pm on Wednesday and Saturday. Students 17 and younger must volunteer with a parent or guardian for their first time, we may make exceptions for future visits. We encourage groups of all kinds and sizes. We can easily accommodate 100 volunteers per “work-shift”. Please fill out this application to sign up yourself (as an individual), your family, friend/s, school, team or group. Normandin Middle School, The Stevens Family, Boy Scout Troop 77, Iota Delta Nu Sorority, Girl Scout Troop # 82004, St. Julies Confirmation Class, Howland Lodge, ... etc.